The man always at the side of Rodrigo Duterte grants Rappler an interview. What is it like being the trusted aide of the president-elect? DAVAO CITY, Philippines – A 12-year-old Christopher “Bong” Go has gone missing, to the dismay of his parents. The year is 1986. The month is February. Manileños are flocking to a road called EDSA. Nuns and soldiers stand face to face, as incongruous a pair as flowers and military trucks. Little did his parents know that Bong was also on EDSA, walking by himself, looking around, fascinated by the upheaval around him. Bong would nurture this fixation on political events. By the age of 14, he had committed to memory the names of all the influential people in his hometown, Davao City. He knew the names of all the congressmen, the mayors, the vice mayors. Three decades later, Bong is the most trusted man of incoming Philippine president, Rodrigo Duterte. He is known as Duterte's aide or executive assistant. Less flattering is his title of “national photobomber” given to him by media because, during the 2016 campaign season, he was forever at the side of the man who would soon occupy Malacañang Palace. His face, carved into gauntness by the relentless campaign pace, is a staple in every Duterte photograph. He’s the guy in the shades, poker-faced amidst the furor around him. While Duterte beside him is the center of upheaval, Bong is the nucleus of calm. He is always in front but never center. Best supporting actor never the star. The enigma beside a candidate so open about his personality, his life. Bong grants me an interview at After Dark, his boss’ favorite bar. We occupy a table in the corner, we talk over empty glasses and beer bottles. A few steps away, the soon-to-be-president entertains his law school batchmates. This time, Duterte’s voice is the background. It’s Bong’s turn in front of the microphone. Bong traces his connection to Duterte as far back as his grandfather, August Tesoro, whose family founded Davao City’s largest printing press. August was so close to Duterte that when the latter had to elope with the woman who would become his wife, August was their driver. When Duterte married Elizabeth Zimmerman, August was one of the principal sponsors. It was fate that brought Bong to Duterte’s side. Sometime 1998, Duterte’s then aide Jimboy Halili died in the middle of a game of basketball. Duterte was then a congressman. He needed someone to pick up his things from Manila. Jimboy was no longer around. Good thing Bong, his friend’s 24-year-old grandson who had just finished his management course at De La Salle University, was in Manila. Bong picked up the stuff. He himself doesn’t exactly know how the transition happened. “Bit by bit” Duterte came to entrust him with more and more tasks, he said. Soon, Bong was put in charge of both personal and official matters. He calls himself Duterte's "utility man." Bong recalls picking up Duterte from his house at odd hours, like 3 am, to bring him to the hospital because of stomach pains. When Duterte’s chief of staff, Patmei Ruivivar, left in 2010, Bong took on some of her tasks as well. In all, Bong has been by Duterte’s side for 4 of his 7 terms as mayor, his one term as vice mayor, and some years of his term as congressman. He’s been through every one of the campaign seasons preceding these terms. 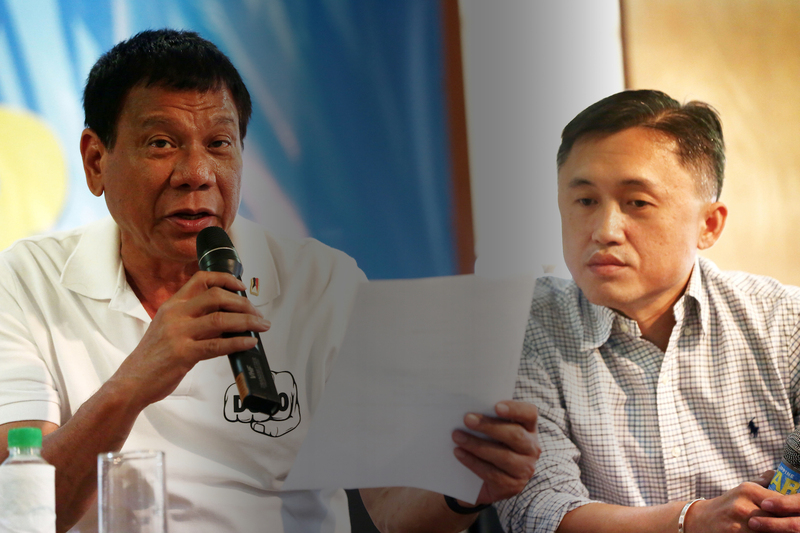 He was up against reelectionist mayor Benjamin de Guzman who, while Representative Duterte was far away in Manila, had been building his own alliances. With his group of 4 loyal compatriots, including Bong, Duterte did his best to convince Davaoeños to make him mayor again. The prize was almost lost. Bong thinks urbanites at the time wanted Duterte back because they noticed higher criminality when De Guzman called the shots. They wanted their streets back and believed only Duterte could get the job done. Duterte won. Suddenly, he was popular again. Duterte’s popularity is higher than ever, having capped his winning streak with victory in the presidential elections. Bong looks around him, at all the people fawning over his boss. Nothing new, he thinks. Unknown to many, Bong, now 42, has a personal life too. He has a wife working in a family business, a son and a daughter in their teens. “Nasanay na rin sila (They’ve gotten used to it),” he says, about how his family deals with his hectic schedule. Because a vacation leave is out of the question for him, about the only time he gets to go abroad with his family is when Duterte and his family go abroad too. The number of text messages Bong receives is indirectly proportional to the number of hours he gets to sleep. He showed me his Nokia phone (he has two more phones) with an inbox of 956 unread messages. He’s lucky if he gets 5 hours of sleep. During the campaign, he was down to 3 hours per day. That’s not counting the minutes of precious sleep he loses when he has to take emergency calls at night. Because of this, his phone needs to be open 24/7. Simply put, when Duterte is busy, Bong is busier. He described what he does after a long day of work. “Bago ako matulog, pinag-iisipan ko muna lahat, pinaplantsa ko muna lahat. Minsan, nananaginip ako, saka pa ako nagdecide,” he shared. “Everything has to be smooth, no glitches,” he said in Filipino. Reporters and participants in Duterte’s sorties will no doubt raise their eyebrows at this, remembering all the times Duterte was late to events, the times they heard something went wrong with his campaign jet or chopper. But Bong Go is not only an events organizer. He’s the gateway to Duterte. Any politician or journalist will tell you that, to get to Duterte, you need to go through Bong first. Even the White House had to call Bong first. Bong sees his role as the filter who allows Duterte to focus on the big decisions. “Minsan, ayaw mo na siya ma-stress sa trabaho niya, 'di ba? Pag gising niya sa umaga, may mga bagay-bagay na may kailangan siya gawin. Let’s say 100 na tao na naghahanap sa kanya. Seventy na ‘yun alam ko kung anong isasagot. Alam ko ‘yung usual na sagot. Ang ginagawa ko na lang, hindi ko na hahantayin,” he said. Bong claims Duterte trusts him to make these decisions since he knows what the mayor likes and doesn’t like. “So far, I don’t think I’ve decided in a way he doesn’t like,” said Bong. This level of access may be too much power for one man. ln a way, it's Bong’s own perspective that determines who and what is irrelevant in Duterte’s life. Duterte may have the final say, but Bong has the first pass. Bong downplays this by saying his boss has other close-ins like Maribojoc Mayor Leoncio “Jun” Evasco who managed his presidential campaign and used to be his chief of staff. But Bong may have played a bigger role in this country’s recent history. Rewind to October 16, 2015, the deadline of the filing of candidacies for national positions for the 2016 elections. The entire country was on its toes wondering whether the controversial Davao City mayor would run for president. There were rumors flying around, even on national media, that around 1 pm, Duterte was already in Manila on his way to file his candidacy. A private jet had been sent to Davao City just to whisk him to his destiny. In truth, claimed Bong, there was indeed a jet waiting for Duterte, but at the time, Duterte was fast asleep. That day, Bong experienced the “longest 8 or 10 hours” of his life. He was in and out of the bathroom for most of those hours. At around 9 am, Bong knew if he didn’t do anything, Duterte would not show up in Intramuros and his adoring fans would be disappointed. He claims, that’s when he made a decision. He knew that, if someone from PDP-Laban filed a candidacy for president, substitution could be allowed later on, providing a “window of hope” for Duterte’s fans. His plan was not really to allow Duterte to run should he decide to, he claims. All he wanted was for his boss’ supporters not to feel let down by their idol. Minutes before the 5 pm deadline for the filing of certificates of candidacy, PDP-Laban member Martin Diño strode into the Comelec office with certificate in hand. Despite errors in the document, the move would allow Duterte to run as Diño’s “substitute,” and eventually emerge victorious on May 9. If Bong’s narration of events is to be believed, Duterte would not be incoming president now if not for Bong’s bathroom break call to Pimentel. Pimentel confirmed this sequence of events to Rappler on May 27. He said it had been decided that party member Martin Diño would file his candidacy as Pimentel was about to board a plane to Switzerland at the time. But he said Bong did not name Pimentel in his phone call, suggesting only that someone from the party file their candidacy. Pimentel also claims they were not initially planning for Duterte's future substitution. They only wanted to make sure their party had a presidential candidate. Duterte found out about Bong’s decision only days after. Bong explained that he did it for the mayor’s supporters. The move did not anger Duterte because as Bong explained, the final decision still rested with the mayor. Then he hung up on Bong for the first time. That was how Bong knew that his boss really did not want to run for president. The boy watching a revolution from the sidelines is now himself making history. Enjoying the trust of a powerful man means he is set to play an even bigger role in the country’s fate. But no matter how close he is to the center of gravity, Bong knows he is also a leaf caught up in a current. Like tonight. At Duterte’s whistle, Bong stands up ready to do his bidding. He cannot leave any place as long as Duterte stays. His whole life revolves around this incorrigible man. In many ways, Bong is still that boy attracted like a moth to the flame of larger events, larger people.